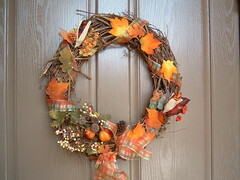 A homemade-autumn-wreath gets younger children involved with nature and the happenings of the autumn season. Add cutouts and make it double as a kid's halloween craft too if you like. Either way, the kids get some fresh air, learn what nature is all about, and participate in decorating around the home for the Fall season. A small list of materials is all that is needed for this simple craft. You can go as small as a paper plate to make the base of your wreath, or as large as using any flat side or bottom of a cardboard box. It depends on what you want for the size of the wreath. If the kids are really young, the paper plate is probably more suitable for them to work with because of the size and the time it will take. Youngsters have much shorter attention spans! Take the kids for a walk where there are plenty of autumn leaves that have fallen in bright brilliant colors like oranges, reds and yellows. 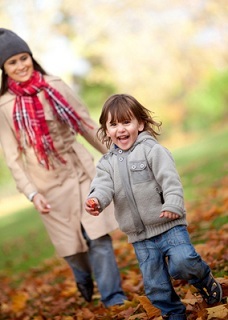 Bring a basket or a bag with you and have the children pick up as many fallen autumn leaves as they may need. Different shapes and colors from different types of trees would be nice. Once you get home, lay the leaves out on a table, give them a quick sort and pick out any ripped leaves. Discard them to the composter. Mom or Dad - Cut out the centre of the plate in a nice round even cut, being sure to leave a wide enough edge to glue the leaves to. Have the kids draw their own images or trace some figures for them on the colored construction paper if they want. Here are some ideas to use for the different colors. Orange – Pumpkins and jack-o-lanterns of course! Black – Black Cats; use the black wool for a tail to hang down. Before you glue everything into place, have a look first at what it what might look like. Have the kids place the items on the wreath themselves and let them decide. Once you have decided how all the items will be placed, go ahead and start gluing the leaves in a circular and even fashion. Add the figures in on the inside edge. Let your homemade-autumn-wreath dry thoroughly for a day. Hang the wreath on a front door, or anywhere in the house where everyone can see and admire it. When making your homemade-autumn-wreath, you can use an imprinted decorative paper plate instead of the white. 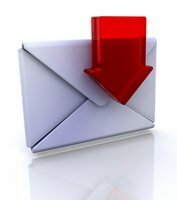 It would hide any white spots, and there are some lovely paper plate packages out there in seasonal colors to choose from. With a simple grapevine wreath, the leaves and just a few extras like small twigs and ribbon, an older group of children can easily make another homemade-autumn-wreath that is simple and yet quite lovely. Involve your kids in the making of a homemade-autumn-wreath this season. It's fun for them, simple and doesn't cost anything really. 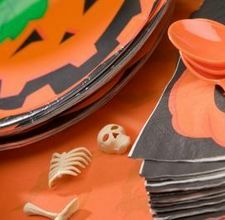 Youngsters will especially delight in making this duo purpose kid's-halloween-craft and gain a lesson in how nature provides us with the beautiful materials.